Whether you are a skincare junkie or someone who barely goes beyond a simple face wash and moisturizer, chances are you would have heard about Clarisonic. 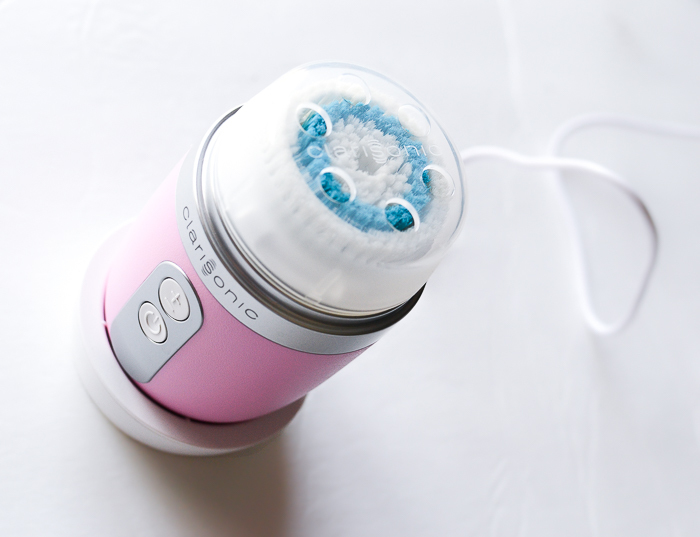 For those of you who might be unfamiliar with it, Clarisonic makes handheld cleansing devices that utilize oscillating brush heads to deliver a superior skin cleansing experience. The devices are generally quite popular, but I have always hesitated on trying one out myself because of a multitude of reasons - unsure if I would use this regularly, would it work on my acne-prone skin, would it irritate my sometimes-sensitive skin. The list was sufficiently long that when I got a mail asking if I would like to try out the newer, compact Clarisonic Mia Fit, I hesitated to say a Yes. I did finally agree to trying it out, though, and I couldn't be happier! I know there are a lot of reviews on Clarisonics - both good and bad - but if like me, you have been on the fence about buying a Clarisonic (or are just curious about one), then do read on to know about my experience with using this device. 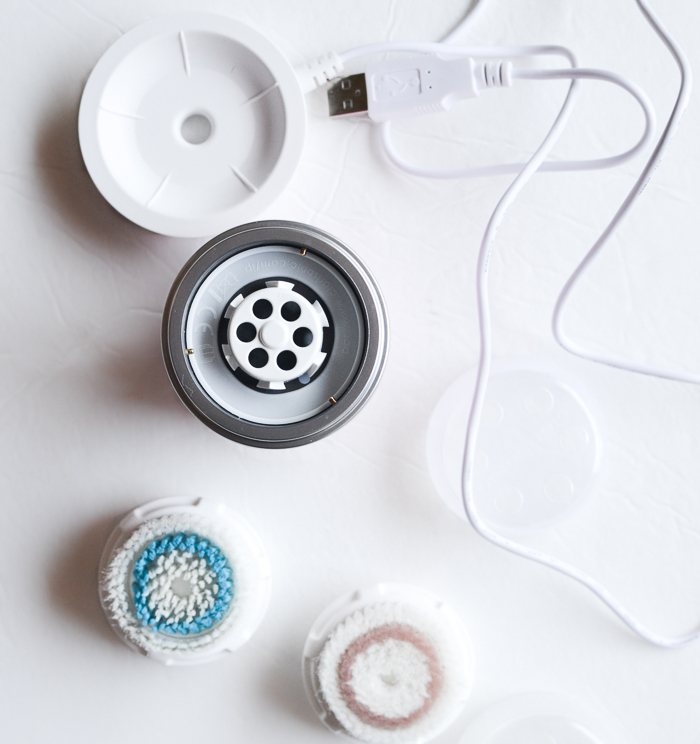 Cleansing device, brush heads, and a USB-enabled charger. I got to try the Pore Ceansing Brush as well as the Radiance Brush. Depending on the sales/promos, the box may include a wall adapter for the charger, Clarisonic cleanser, and the number/type of brush heads might vary. The device is also available in 2 other colors: white and blue. 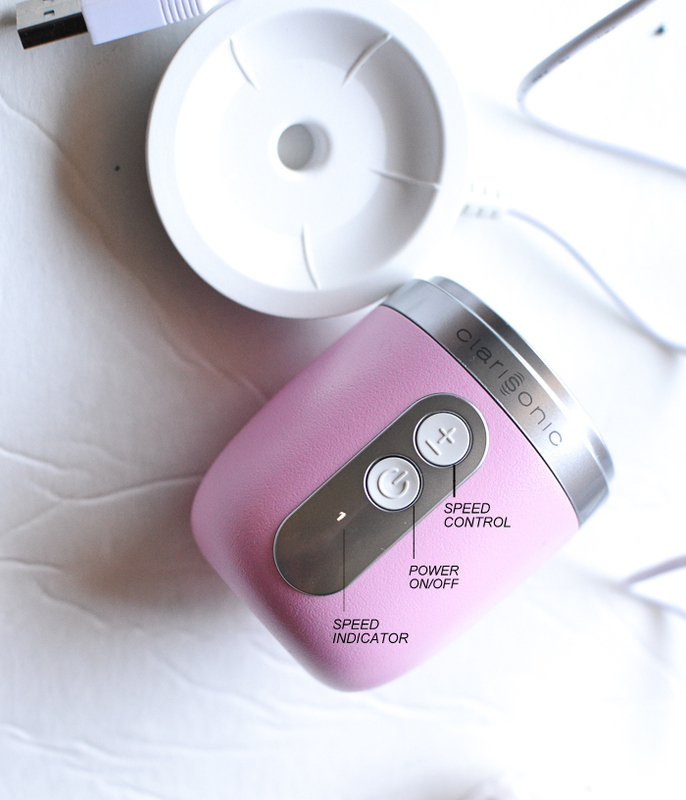 To charge the Clarisonic Mia Fit, connect the USB-enabled charger to a power source - use a wall adapter to connect to a regular plug or plug the charger into the laptop - and place the Clarisonic device into the cradle. A quick buzzing as well as a blinking red battery indicator shows that it's charging. Once completely charged, the light turns green. The Mia Fit takes about 18 hours to charge completely, and the charge lasts about 28 minutes depending on the speed settings used and frequency of use. I use the Mia Fit twice a day and charge about every 2 weeks. I don't wait until the charge runs out completely because it does take a long time to recharge. I did try it once - just to know how long the device would last on one charge - and it lasted a little over 2 weeks. To use, snap the brush head on to the device. A twist-lock mechanism holds the brush head in place on the device, and it helps to use the brush cap to place and remove the brushes. The Mia Fit is waterproof and can be used in the shower. You don't have to worry about getting this wet, though I am assuming it cannot be left submerged in water, and you definitely should not put this into the dishwasher! Cleaning the device is quite simple - the device as well as the brush heads can be washed with a mild hand soap (or face wash if you prefer), pat dry with a towel and leave to dry. I do this after every use, wash the brush with soap and rub on a towel to take off excess water. I also add soap on to the device and rinse out with hot water, shake off excess water and leave to dry. I have read reviews complaining about difficulty keeping the Clarisonic clean, but I have not had any issues so far. 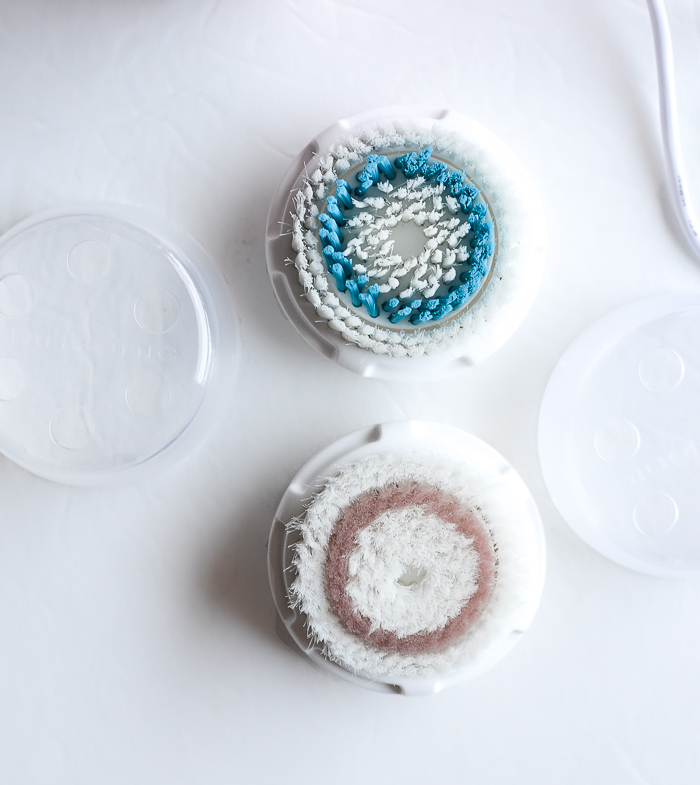 Clarisonic brush heads - I use the blue Deep Pore Cleansing brush (the brush in the pic is slightly damp and hence the clumpy look) and the Radiance brush. The Radiance brush feels softer and is a little fluffier than the Deep Pore Cleansing brush, but between the two I prefer the Pore Cleansing brush. I have noticed occasional dry patches with using the Radiance brush, and I think this is because I might be pressing the brush more into my skin - because the brush is softer. That's just my theory, though, but when I repurchase, I will probably stick with the Pore Cleansing brush. The power on/off button turns on/off the device. The device has two settings - a 60-second everyday cleanse and a longer 80-second deep cleanse. Select the desired setting using the speed control button, and the selected setting is highlighted with a 1 (60-second) or 2 (80-second). Both cleanse settings are broken up into 20- and 10-second sections, sort of like a timer for each section of the face, and a quick change in vibration lets you know when each section ends. I find it helpful because otherwise I tend to just massage the same area of my face, especially in the mornings when I am supersleepy :P I generally stick to the 60-second setting and use the 80-second setting when I have to take off makeup or sunscreen residue. 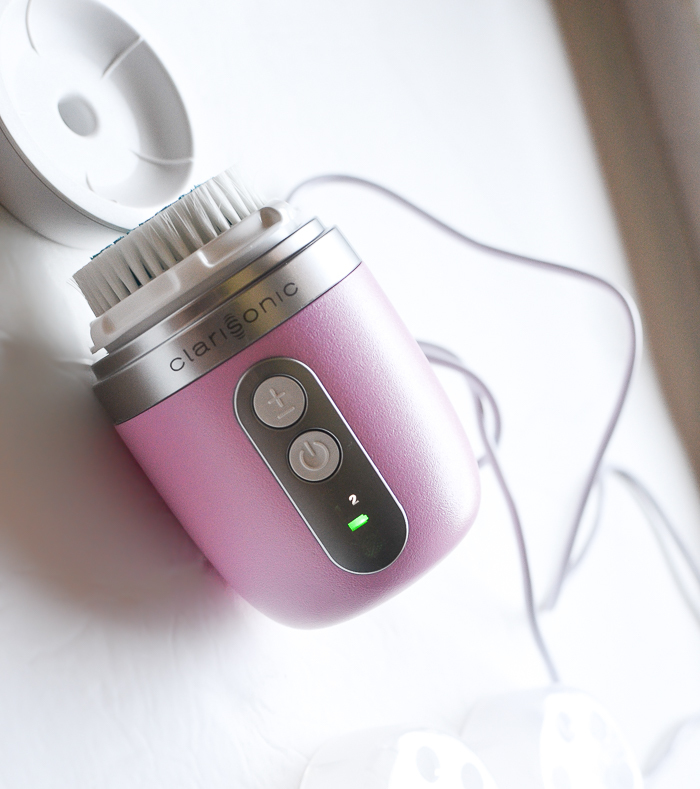 The Clarisonic Mia Fit has a very compact, travel-friendly design. It fits snugly in my palm, and I love how easy it is to carry and store. Clarisonic makes it's own range of skincare cleansers, but I have been using this with my regular cleansers - Philosophy Purity Made Simple face cleanser as well as the PurErb Cleansing bar. The cleanser can be applied on to the brush head directly, but I prefer to massage the cleanser over my face and then use the Clarisonic brush to clean. 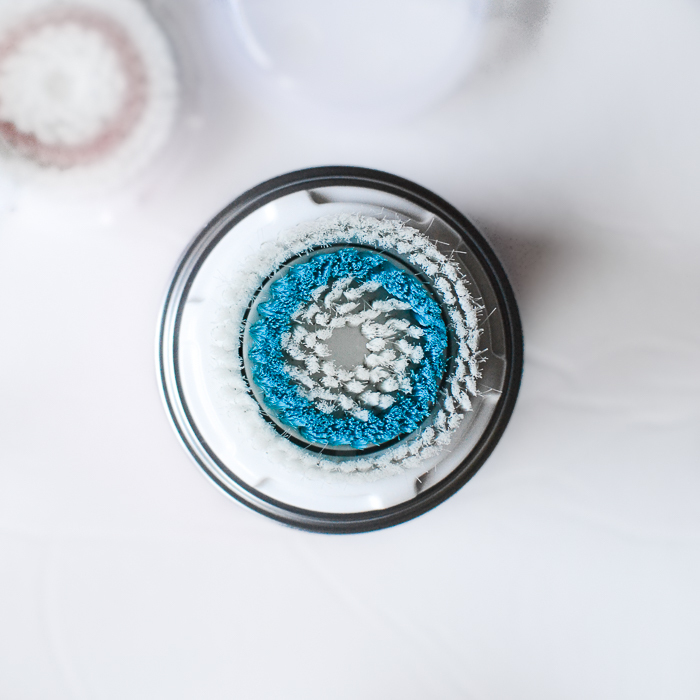 Do not use cleansers with microbeads with this device as bits can stuck in between the bristles and in hard-to-reach nooks and crannies in the device. The Clarisonic devices use oscillating brushes to clean the skin - the brush heads do not rotate/spin. Rather, the brush fibers move in a side-to-side motion, 10 degrees to each side and about 300 times per minute, and this helps lift up impurities and cleans skin better than with a cleanser-and-hands routine. One of the reasons I had stayed away from Clarisonics was that I had assumed this was an exfoliating device, but I think the effect with using this brush is similar to using a cleanser with a wash cloth. 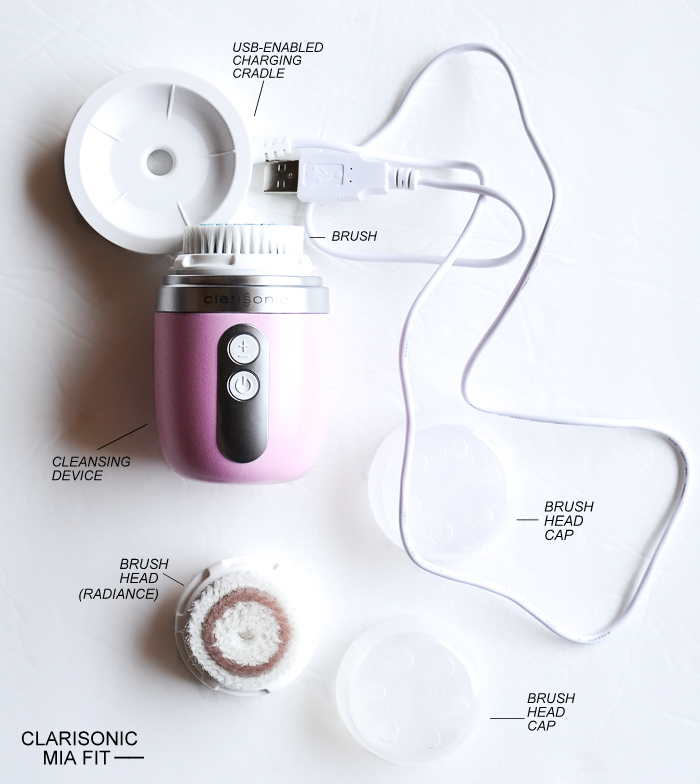 Clarisonic Pore Cleansing Brush - the brush fibers are arranged in circles, and when the device is turned only the inner bristles move. The outer ring of white bristles don't move. While cleansing, move the brush head in small circles over the skin. I have oily-combination skin, and my skin does tend to get easily irritated with exposure to sun and/or harsh scrubs/peels. I was afraid that the Clarisonic might be a bit too harsh on my skin, but I have used it twice a day with no issues. For me, using the Clarisonic has been like using a cleansing cloth - a little gentler than that - and I think one reason I have not had any irritation is because I am careful to not press the brush too much into the skin and avoid scrubbing my face with the. Move the brush around the face in gentle circles and let the oscillating bristles do the job. 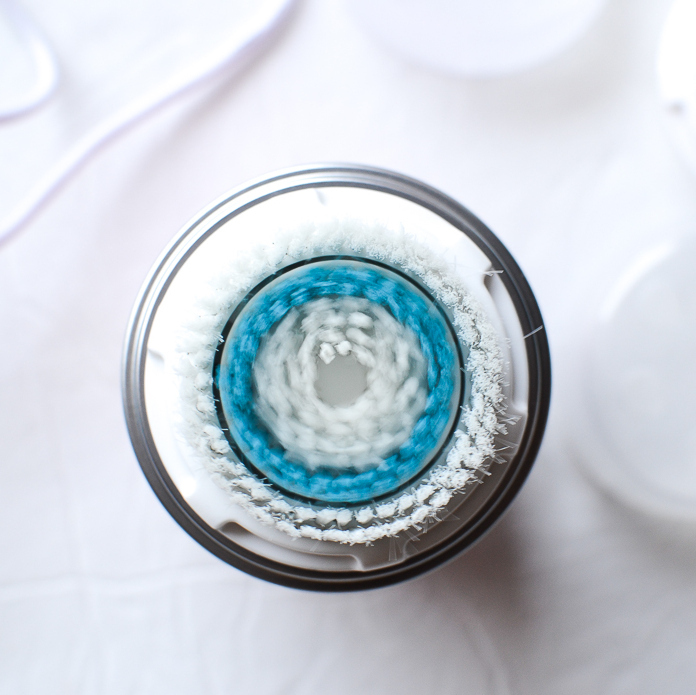 Clarisonic Pore Cleansing Brush - with the device turned on, only the inner circle of blue and white bristles oscillate. As for my experience with using the Clarisonic - it definitely lives up to the claim of delivering a better cleansing experience. Both the Philosophy cleanser as well as the PurErb cleansing bar which I have been using with this device are reasonably good cleansers on their own but cannot take off makeup and other stubborn residue from my skin. I have to double cleanse, use a makeup remover first and then use the cleanser. With the Clarisonic, though, it's a one-step process. Apply cleanser, use Clarisonic, and my skin is absolutely clean without the need for a double cleanse routine. So yes, it does work, and it is far superior to using just cleanser and hands. I do need to take off eye makeup with a makeup remover, of course, but that's about it. It saves time, and at the end of a long, tiring day, it helps that there are no extra steps with using this device. I have oily-combination skin that gets irritated with exposure to sun and/or harsh scrubs/peels. I was afraid that the Clarisonic might be a bit too harsh on my skin, but I have used it twice a day with no issues. While I know skin types differ, I think it helps to exert only gentle pressure while moving the brush on the skin and to select a brush that suits your skin type best. I did check some of the other brushes at my local Sephora, and the Luxe and the Acne brush seem the softest and might be a better choice if you have very sensitive skin. The one thing I have read (and worried about) in a lot of Clarisonic reviews is the purge - skin breakouts and pimples starting after using the Clarisonic. Thankfully, I did not have even one breakout or pimple with using the Clarisonic. I think it helps to change/add one thing at a time with any skincare routine. When starting with a Clarisonic, it's best to stick to products, especially face washes, that your skin is already used to. Also, avoid trying out the device when your skin is already sensitive and/or prone to acne breakouts (for instance, after a harsh sun exposure or if you have acne breakouts due to hormonal issues). The Clarisonic Mia Fit has been a welcome addition to my skincare routine. The device does a good job of cleansing my skin, helping it absorb skincare products better and makeup to go on smoother. It is convenient to use (and to keep clean), and the compact design is a huge plus for me (small-shared space). It's also great to travel with and/or carry around in the bag. Going by my experience, I would definitely recommend adding the Clarisonic Mia Fit to your skincare routine. A lot of stores (as well as Clarisonic) have great return policies, so it's easy to try it out for yourself. The Clarisonic Mia Fit was provided free c/o Clarisonic for me to try out.